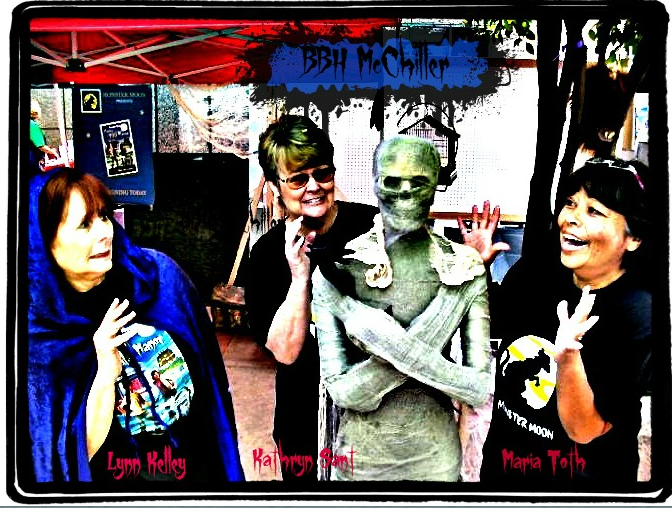 BBH McChiller writes the spooky, fun Monster Moon mystery series for kids ages 8 to 12. The unusual name is actually the pseudonym for three authors living in Southern California: Lynn Kelley, Kathryn Sant, and Maria Cisneros Toth. The mystery series began one Halloween during a discussion at a writers’ meeting about their greatest fears and ended up being one of their most rewarding experiences. Each book is a stand alone and doesn’t depend on reading them in order, although it’s best to start with Book 1, Curse at Zala Manor. The rest of the books can be read in any order. BBH stands for Books Born Here, the name of their writers’ critique group. McChiller seemed liked the perfect name for an author of spooky mysteries for kids. The Monster Moon coauthors are also known as the Zombuddies, ZB-L, ZB-K, and ZB-M. All Monster Moon book fans are honorary zombuddies! The original Zombuddies, ZB-L, ZB-K, and ZB-M.
All Monster Moon fans are our zombuddies! Kathryn Sant is a retired Obstetrician who has witnessed the births of thousands of future readers. She has published a middle-grade novel, Desert Chase (Scholastic), and written for the Society of Children’s Book Writers and Illustrator’s newsletter. She is currently working on a middle-grade boys’ adventure novel and the next Monster Moon book. Her interest in adventure, accurate research, and genealogy has led to a love of world travel, but she also enjoys quiet evenings reading with her dogs at her side. Maria Cisneros Toth has a background in journalism. 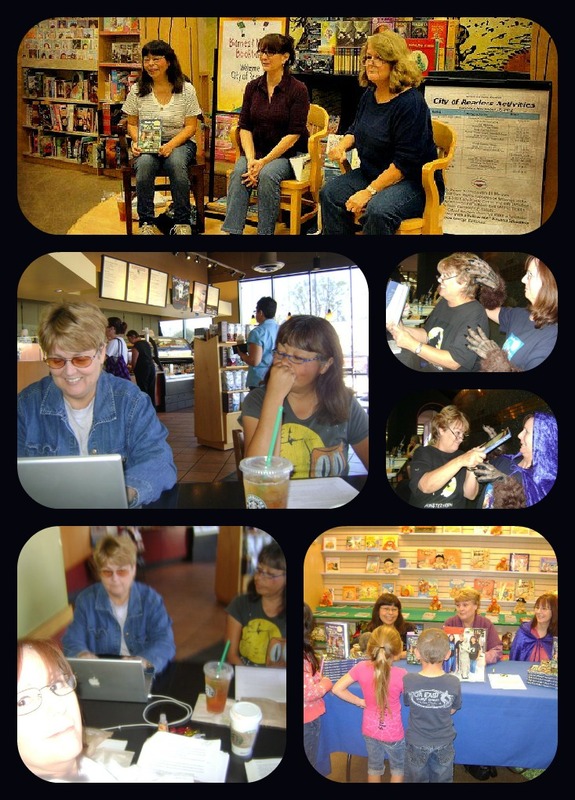 Her work, including children’s stories, has appeared in The Los Angeles Times and the San Bernardino Sun. She’s served as a Reading Buddy at local schools and has appeared on Storytime, a children’s television program. Her novel Butterfly Hollow will be released in the Spring 2013. Her favorite holiday is Halloween. She enjoys ghostly tales and reading epitaphs at historic graveyards. 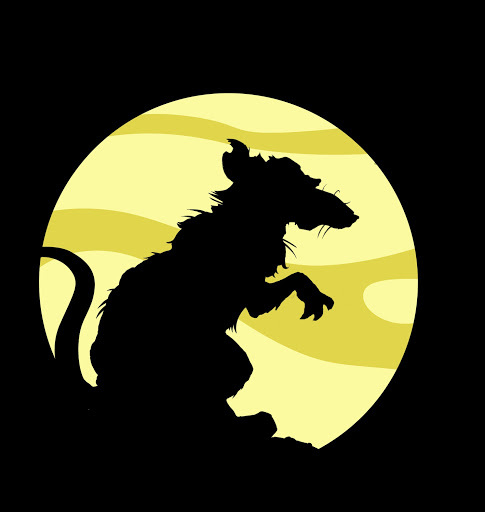 Monster Moon Logo featuring Vlad, the pirate rat. Kids love him! Read an Interview of BBH McChiller by Nutschell Windsor of The Writing Nut. 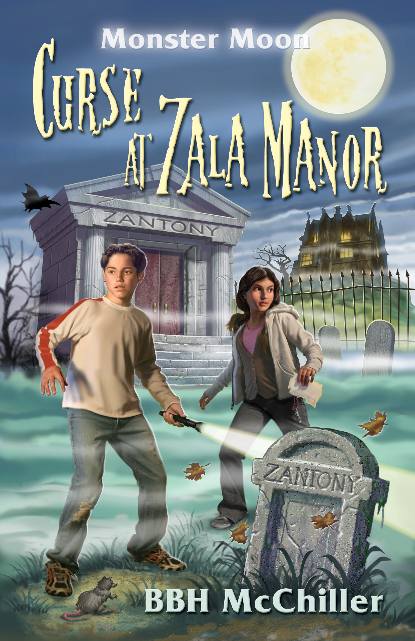 It’s almost Halloween, and twelve-year-old AJ Zantony’s world is threatened by an ancient curse that releases wicked pirates who had been trapped for centuries in his Aunt Zsofia’s creepy mansion, Zala Manor. The pirates–a vampire count, a pegleg skeleton, and a zombie–have three goals: to find a lost treasure, unleash the restless dead from their graves, and to settle a very old score by destroying the Zantony bloodline. AJ has to stop them before midnight during Aunt Zsofia’s annual Halloween party. Except he has a big problem–monster phobia! He’s scared to death of monsters. But if he doesn’t act fast, the streets of Craggy Cove will be crawling with zombies. Will AJ overcome his fear and stop the monsters or bail out? Will Craggy Cove become Zombie Central? Who will be alive when midnight tolls? From the moment AJ and his friends, Emily Peralta and Freddy Hangman Gallows, step off the train in Old Chinatown, AJ s sixth sense kicks in, an omen of looming danger! A mysterious fortune teller warns AJ and his friends of vile forces and impending doom, until the Day of the Jewel. AJ should have listened. A shadowy stranger lurks in the crowded alleyways and spooks AJ by slipping him a bizarre card with a threatening message. Is it a joke or are AJ and his friends being stalked by a man in black? In a twist of events, AJ and Freddy end up lost in a dark and marshy bog, where they are surrounded by thick fog, creepy sounds, bizarre creatures, and ghostly apparitions. In the depths of the creepy bog, they stumble upon a missing girl and horrifying evidence of toxic pollution. But somebody doesn t want them to escape. Who? Why? 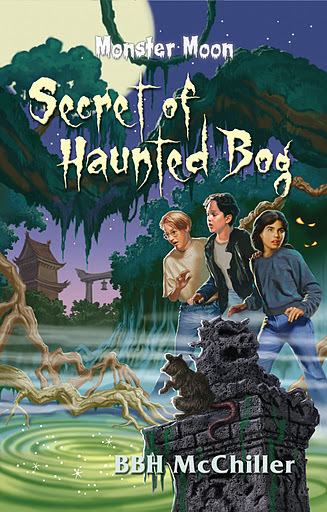 Can AJ and his Zombuddies work together to uncover the secret of the haunted bog? Will they come out alive? You can read reviews on My Books Page. Greg Martin is a freelance illustrator who grew up on a constant diet of cartoons. His animation creations have been used by studios such as Disney, Hanna-Barbera, Warner Brothers, and Marvel Productions where he was key designer in the animation department. He is a graduate of the Art Center of College of Design in Pasadena, Califronia. 7 Responses to Who Is BBH McChiller? Oh how I loved this! My fav page on your blog bestie. The pics are wonderful! Following by email. Mwah! Thanks so much, most awesome bestie! I love your feedback and appreciate you taking the time to explore my new site! You rock!